On Wednesday, sports network ESPN announced it was laying off employees effective immediately. The long-expected announcement follows a similar purging of 100 employees back in April. At present ESPN has about 87 million subscribers, a big drop from 2010 when it had around 100 million subscribers. Even at this late date there are still those who claim that ESPN’s decline has nothing to do with its liberal bias. Bram Weinstein, who used to work at ESPN and now hosts a radio show at ESPN affiliate 980 AM in Washington, D.C., insisted the layoffs are just a “market correction” on his Wednesday show. ESPN is adjusting to the fact that millions of people are going “mobile,” paying to have NFL, NBA, and MLB games streamed directly to their cell phones and iPads, or so he claims. 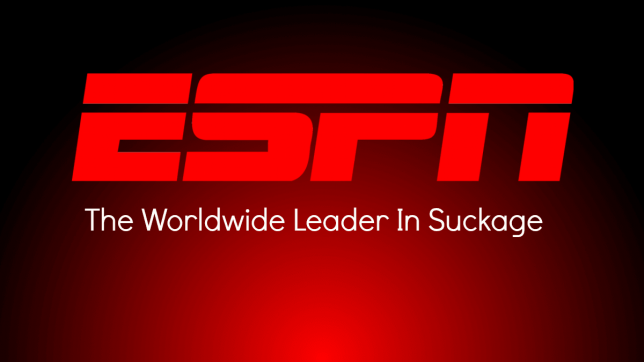 Undoubtedly there are multiple reasons why nearly 13 million subscribers have left ESPN. But to listen to ESPN and its defenders, going mobile proves that subscribers are not fleeing ESPN because of its left-wing bias. It never seems to occur to them that perhaps one of the reasons a lot of people are dropping their ESPN subscriptions and going mobile is that they are tired of ESPN’s leftist crap. And recent months have done nothing to dispel the idea that ESPN is indeed full of leftist crap. Back in April, 25-year ESPN employee Linda Cohn suggested that politics was responsible for the decline in subscribers. “I don’t know how big a percentage,” she said, “but if anyone wants to ignore that fact, they’re blind.” This angered the ESPN top brass and they suspended her. The episode, when compared to the Cohn suspension, exposed a gross double standard at ESPN. Preaching lefty politics or smearing conservatives is acceptable. Questioning ESPN’s leftward lurch is not. ESPN shows no signs that it will get off the Social Justice Warrior route. As long as it doesn’t, it will continue to hemorrhage viewers. Current ESPN employees would be well-advised to update their resumes.